Minister for Health & Medical Education, Bali Bhagat and MLA Sat Sharma today dedicated three passenger vehicles (Busses) worth Rs. 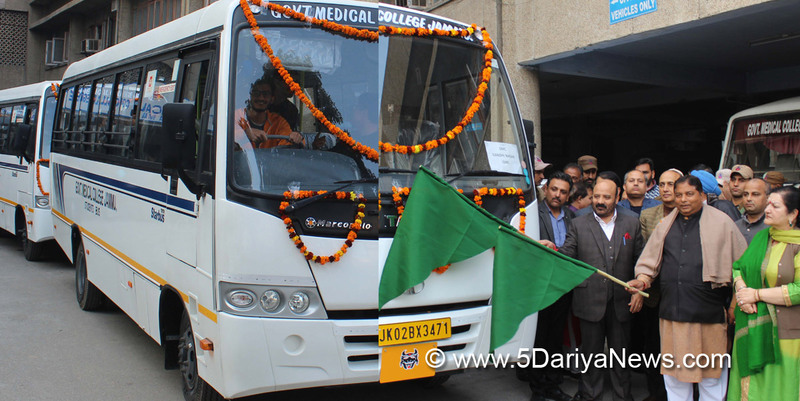 52.73 lakh to the Government Medical College, Jammu to facilitate the medical students.“The newly acquired vehicles will transport the medical students from different destinations to GMC and drop them back on daily basis. This was a much-needed facility for the students, as earlier; there was only one vehicle that was being used for transportation of students, which too has outlived”. Speaking on the occasion, the Minister said that this is the best New Year gift to the students of GMC, Jammu and the facility will meet the requirement of a large number of students as well as staff. He congratulated the management and students for the facility and urged for its judicious use.On the occasion, the Minister and the legislator exchanged New Year greetings with the doctors, para-medics and students of GMC and wished them prosperity and good health. They also called on the medical fraternity to work with added zeal and dedication and serve the mankind with best missionary spirit. Meanwhile, the Jammu Medical Representatives’ Association (JMRA) felicitated the Minister for Health & Medical Education, Bali Bhagat to mark the beginning of New Year at an impressive function organized here today.They extended good wishes and exchanged pleasantries with the Minister which were equally reciprocated by the Minster.Speaking on the occasion, the Minister appreciated their role of the Medical Representatives and said that they are immensely contributing to the society and helping in State’s GDP. He urged them to work in close coordination with the doctors and promote good and genuine products, which are beneficial for the poor patients and general masses. He politely urged them to follow the protocol of visiting and meeting the doctors in the hospitals strictly after the duty hours without disturbing the schedule of the medicos.Besides, President and General Secretary of JMRA, P.S. Khalsa and Bavneet Singh, a large number of Medical Representatives from across the Jammu Division were present on the occasion.